"Moooving" straight from the shelf right into your heart, this little cow is sure to delight any Steiff collector of any age. This is a soft, plush cow made from a black and white woven fur. It's hooves are a tan woven fur, and it has a cute little pink plush nose. This cow is machine washable and has black glass eyes. 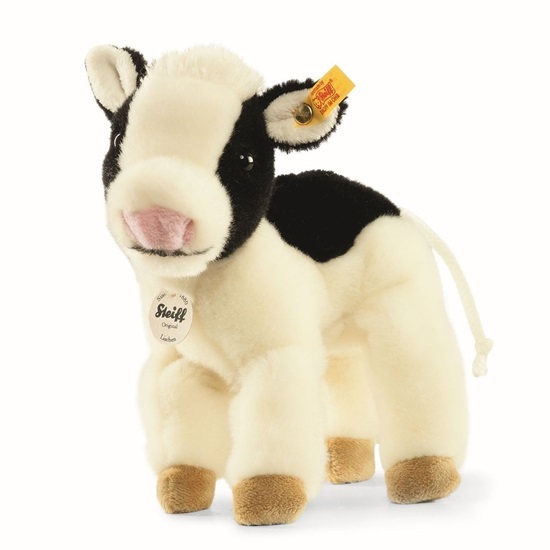 This sweet baby bovine is good for all ages and comes from Steiff's "Best For Kids" Collection.